Looks like they fixed the hygrometer at the MAP yesterday. Noticed it went offline on wetherzone briefly. January ended up being my coldest by 0.9c with and average max of 30.7c. MAP was cooler at 29.9c, the coldest Jan there since 2009. Starting Feb with 40.8mm in the gauge. 118 mm to 7am this morning. Marakai: we were discussing the BOM climate outlook at home a couple of weeks back. It really goes to show that anything is possible nowadays and modern man understanding of climate is in its infancy. Seems the BOM are no longer confident in the monsoon moving north in the FNQTC over the later part of this week as initially forecast. 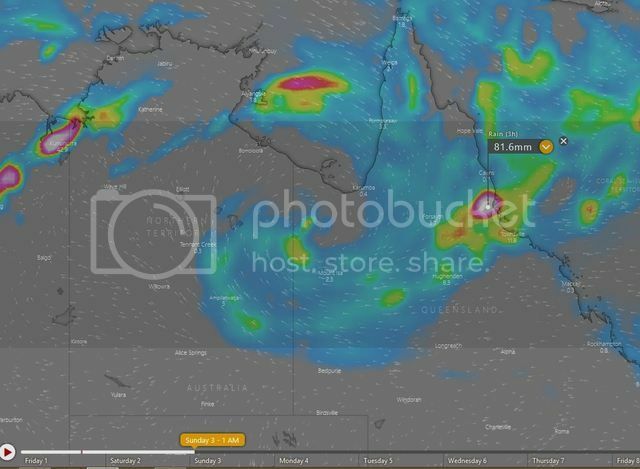 The two main models GFS and EC have run counter to what the BOM were forecasting keeping the convergence area/monsoon in the Herbert/Burdekin districts. Your a brave man HF leaving Cairns during the Wetseason, I refuse to travel anywhere for fear of missing the rain or a Cyclone event Safe Travels. You have to feel for the poor bugga's...Desert like conditions for years and then this evolving major flooding event..
Aren't there warnings signs around Redlynch Valley about possible floods? At least they don't have dam releases that can threaten, or dothey? As in... cCome back from work and house is gone.. for the greater good. Or.. Make your bed in your tinnie tonight. Just got some very strong winds in that cell headed Cairns way. The rain knocked our internet out for a good 20 minutes or so as well. We had a torrential downpour at Freshwater for about 30 minutes...water rushing down Merrybrook Street and through the school. Haha Scott! you never know, Council may consider? Cairns and Townsville neck and neck so far today- both at 44mm each, wonder which will be greater at 9am??? Fast n Furious downpour this afternoon in Portsmith, had to jet out of work and save the car from the rising waters, absolutely flooded down there! How often does that happen marakai…?...Every storm...? Yeah basically Scott, heavy rain blocks the satellite signal, Vast TV drops out too. Wow, a lot of water sitting off the coast right now. Looks like I have touch over 30mm in the tank. Be good for a couple of dryer days, the lawn starting to get an odour up. Before I lived here I used to go to Darwin only in the wet season. That wasn't this morning. Could have been yesterday evening though, water everywhere at Manoora. Thanks for the drone footage Pacman. 6 registered (AndrewM, Ben K, crikey, mysteriousbrad, 2 invisible), 68 Guests and 3 Spiders online.